This photo was taken just after sunset in September 2013. It shows the Crescent Moon in conjunction with planet Venus. The Crescent Moon phase lasts about 6 days, starting after the New Moon when it first becomes visible as a thin sliver, and ending when it reaches First Quarter. 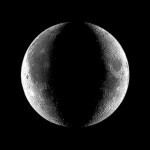 If you need to brush up on your Moon phases, see this post. Warning: Finding the Sun when it’s up is easy, but you should never look directly at it. That could permanently damage your vision. Even when the Sun is behind a cloud, or just about to set, and it doesn’t “hurt” to look at it, there are still ultraviolet (UV) rays making their way to your eyes. Some rays pass through clouds, others reflect off clouds. And yes, you can get sunburned on a cloudy day. Good sunglasses block both UV-A and the more powerful UV-B. You should own and use such glasses. But even they won’t prevent damage if you look directly at the Sun. There are some special filters that allow you to safely view the Sun, but they’re not cheap. Read more about that here. Finding the Sun after it has set is more of a challenge. There’s a plethora of apps for mobile and desktop computers that can tell you where the Sun is at any time. They will generate a simulated view of your sky, wherever you are, and display accurately-positioned celestial objects with IDs. Click on the thumbnail below to see a display from SkEye, which I have running on my Android tablet. You’ll see it shows the Sun below the horizon, about 10 minutes after sunset. Even without a computer, there’s a simple trick you can use to “see” the Sun after it’s set. Go outside just after sunset and find the Crescent Moon. Visualize the Moon as a “bow,” and draw-in an arrow with your imagination (yellow line in photo). 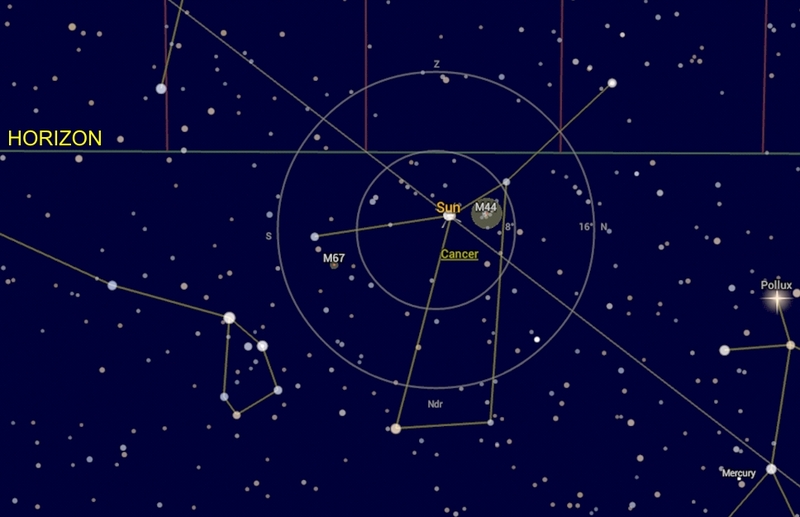 That arrow must intersect the Sun, since the illuminated part of the Moon is facing the Sun. But this only gives you the direction to the Sun. How far the Sun is below the horizon depends on how long after sunset you make the observation. Since the Sun moves with a speed of 15°/hour, its position can be easily estimated. Interestingly, you can do the same thing with Venus, but you’ll need a telescope to see its phases. 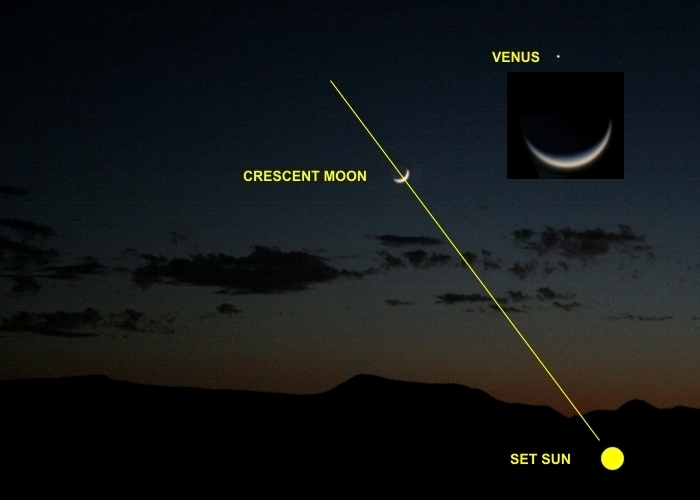 The inset in the top graphic shows a magnified view of Crescent Venus. The arrow from Venus would be at an angle to the arrow from the Moon, since the two arrows must converge at the Sun. If you draw-in the arrow from Venus with your imagination, you’ll see the two arrows converge as described. The Sun is located at what artists would call the vanishing point for those two arrows. Of course, if Earth had two moons you could do this easily without a telescope. But if Earth had two suns, like the fabled Tatooine of Star Wars, the geometry gets a bit more complicated. Still, the basic idea would work. In fact, if the positions of all the objects (stars, planet, moon) were just right, you could see a “double crescent” moon. The gravitational stability of such a system would be questionable, but hey, we’re using our imagination here. Click on the thumbnail below to see what a “double crescent” moon could look like. 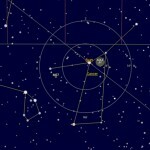 Geometry is a large part of astronomy. Centuries before telescopes existed, astronomers were charting the cosmos using angles, lines, and circles. Visualizing the invisible is only a small part of what they accomplished.